Fasten your safety belt when on the road. Apply the parking brake when you leave your vehicle. Do not roll back when you start. You may hit someone behind you. Partly engage the clutch before you take your right foot off the brake. Put on the parking brake whenever necessary to keep from rolling back. Release the parking brake only when you have applied enough engine power to keep from rolling back. 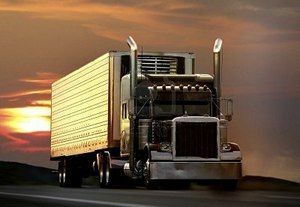 On a tractor-trailer equipped with a trailer brake hand valve, the hand valve can be applied to keep from rolling back. Name some things you should check on the front of your vehicle during the walk-around inspection. Can you bring the Vehicle Inspection Memory Aids with you to the exam? These questions may be on the written exam. If you cannot answer all of them, study the 7-Step Inspection Method. Look at your path - Look at your line of travel before you begin. Get out and walk around the vehicle. Check your clearance to the sides and overhead in and near the path your vehicle will take. Back and turn toward driverʼs side - Back to the driverʼs side so you can see better. Backing toward the right side is very dangerous because you cannot see as well. If you back and turn toward the driverʼs side, you can watch the rear of your vehicle by looking out the side window. Use driver-side backing—even if it means going around the block to put your vehicle in this position. The added safety is worth it. Use a helper - Use a helper when you can. There are blind spots you cannot see. The helper should stand near the back of your vehicle where you can see the helper. Before you begin backing, work out a set of hand signals that you both understand. The most important signal to agree on is a signal for "stop". If you lose sight of your helper, you should stop immediately and get out of the truck to look. When backing a car, straight truck or bus, turn the top of the steering wheel toward the direction you want to go. When backing a trailer, turn the steering wheel in the opposite direction. 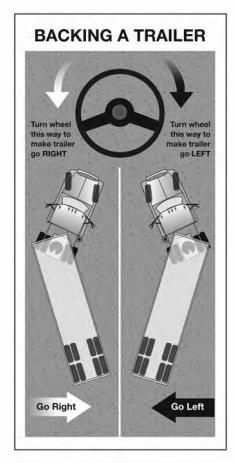 Once the trailer starts to turn, you must turn the wheel the other way to follow the trailer (see figure 2-8). When you back with a trailer, try to position your vehicle so you can back in a straight line. If you must back on a curved path, back to the driverʼs side so you can see. Back slowly - This will let you make corrections before you get too far off course. Use the mirrors - The mirrors will help you see whether the trailer is drifting to one side or the other. Correct drift immediately - As soon as you see the trailer getting off the proper path, correct it by turning the top of the steering wheel in the direction of the drift. Pull forward - When backing a trailer, make pull-ups to reposition your vehicle as needed. Why should you back toward the driverʼs side? What is the most important hand signal you and the helper should agree on? A question about this shows up on the written exam pretty frequently. Remember to always work out a set of hand signals before you begin backing and be certain you both fully understand the "stop" signal. If asked on the written exam, you should always back towards the driver's side of the vehicle as backing towards the passenger side is extremely dangerous due to a large number of blind spots. What is the most important hand signal you and a backing helper should agree on before backing? Use a helper when you can. There are blind spots you cannot see. The helper should stand near the back of your vehicle where you can see them. Before you begin backing, work out a set of hand signals that you both understand. Agree on a signal for "stop." What is the best way to hold the steering wheel of a large commercial vehicle? How should you prevent a manual transmission truck from rolling backwards while stopped on an incline? What does a "pull up" refer to? When backing a trailer, make pull-ups to reposition your vehicle as needed. Back to the driver's side so you can see better. Backing toward the right side is very dangerous because you cannot see as well. If you back and turn toward the driver's side, you can watch the rear of your vehicle by looking out the side window. Use driver-side backing-even if it means going around the block to put your vehicle in this position. The added safety is worth it. Backing towards the passenger side is often referred to as "blind side backing." It is very dangerous due to low visibility and should be avoided whenever possible, especially in a combination vehicle. Use a helper when you can. There are blind spots you cannot see. The helper should stand near the back of your vehicle where you can see them. Before you begin backing, work out a set of hand signals that you both understand. The most important signal to agree on is a signal for "stop". If you lose sight of your helper, you should stop immediately and get out of the truck to look. During backing, a helper should only be used as an additional tool to backing safely. Never put 100% trust into the helper and when in doubt, always stop and get out to look.